Peel-and-seal adhesive strip forms a permanent, tamper-evident seal that must be cut or torn to open. Bottom 1/4" vent hole allows air to circulate and moisture to escape. Suffocation warning printed on bag alerts users of potential dangers to children. 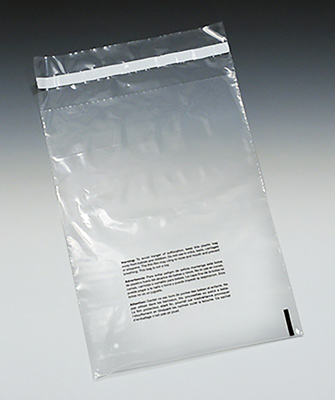 Warning message printed in English, Spanish, and French states: "Warning: To avoid danger of suffocation, keep this plastic bag away from babies and children. Do not use in cribs, beds, carriages, or playpens. The thin film may cling to nose and mouth and prevent breathing. This bag is not a toy."